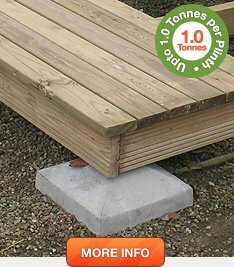 The Swift Plinth Plus is an ideal foundation for Log Cabins, Garden Offices & Studios, Sports Pavilions, Static Caravans and SIPS Buildings, Timber Frame Buildings and Port-a-Cabins. The Swift Plinth Plus product is suitable for heavy-duty applications up to 2.5 tonnes per plinth and spans greater than 2 metres between plinths. This makes it ideal for Log Cabins, Garden Offices & Studios, Sports Pavilions, Static Caravans and SIPS Buildings, Timber Frame Buildings and Port-a-Cabins. 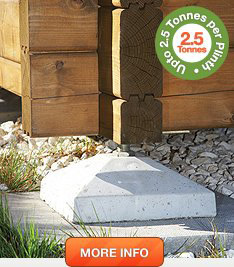 Top Stone – pre-cast and reinforced concrete plinth (320mm x 320mm x 120mm) for housing the bracket. 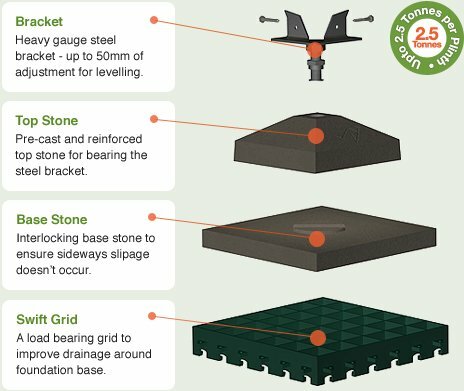 Base Stone – a pre-cast and reinforced concrete pad (500mm x 500mm x 50mm) to interlock into the Top Stone allowing load spreading and prevention of sideways slippage. If you have any questions or concerns on the Swift Plinth Plus and whether it’s right for your project, contact us and we will be happy to help you. What shape(s) of bracket do you need? What thickness of timbers will the brackets connect to?